Microsoft suffered a worldwide issue affecting cloud services including Office 365, Azure Portal, Dynamics 365 and LinkedIn, with many users unable to log into the cloud-based services. The issue began this morning at 7.15am Sydney time and is understood to have impacted a number of enterprise customers. The impact was particularly felt in Australia as the work day began. Microsoft confirmed the problems and blamed a “network issue” that was causing problems for Azure Active Directory. “We've identified a network issue that is affecting authentication to multiple Microsoft 365 services,” the company said in an advisory. Microsoft said in an update customers “that have their authorisation cached are unaffected by this issue, and new authentications are succeeded approximately 50 percent of the time", though it acknowledged some customers would still face issues. "Our telemetry indicates that service availability has improved significantly and most authentication requests are succeeding; however, we still are observing residual impact to some services," it said. "We're working to develop a remediation strategy for all remaining impact." Deakin University - a large Australian user of O365 services - warned its staff in an advisory that the impact was being felt university-wide and that the estimated duration of the problem could be up to six hours. Downdetector, an outage tracking service, showed a heatmap of the problems, which show that the east coast of Australia as well as New Zealand are feeling the brunt of the impact. Microsoft also said that the problems were impacting access to US government cloud resources. 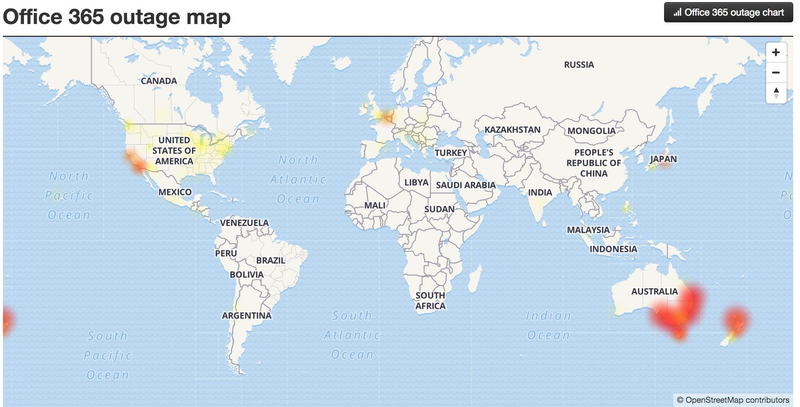 The impact of the outages is spreading as other parts of Asia wake up, with multiple Japanese users reporting login problems at 8am local time. Microsoft said that "most services had fully recovered" by 11.00am Sydney time.